Diminished by drought and tarnished by wildfire, Crystal Lake is not the glistening destination it once was. 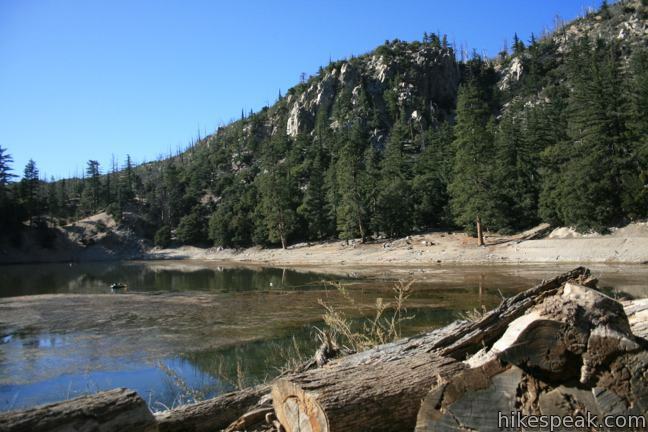 Crystal Lake is the only naturally occurring lake in the San Gabriel Mountains, cradled by granite summits north of the San Gabriel River Valley above the city of Azusa at 5,500 feet. 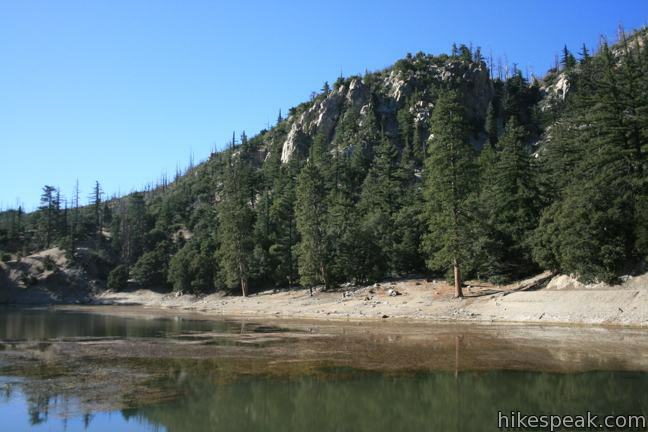 It is a 1 1/3-mile round trip paved hike to Crystal Lake with 150 feet of elevation gain. The 2002 Curve Fire filled the lake with ash and debris, closing the area to visitors for several years. The long-closed road to Crystal Lake Recreation Area is open, but until the small mountain lake regains clarity, it will be more of a draw to fisherman than hikers. You may be able to drive up to within a tenth of a mile of Crystal Lake, but the paved one-way road that circles past Crystal Lake and Crystal Lake Campground is often gated closed, requiring hikers to trek up the road to the lake. March up the pavement through a pine forest heading northwest toward the lake. After 0.45 miles, when you see a sign for the lake, turn left and walk down toward a parking area with bathrooms. 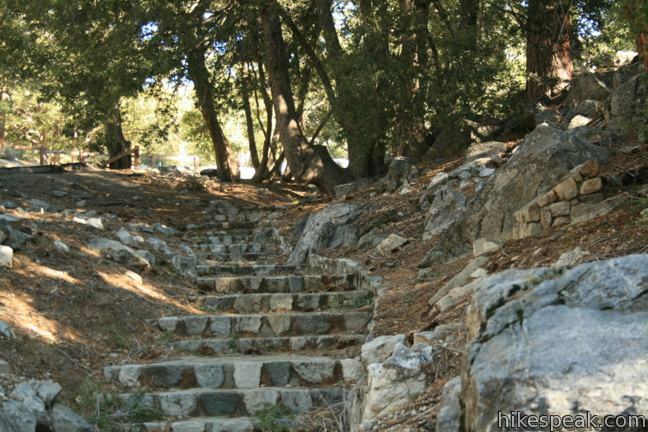 Take the dirt path to the left of the lot which becomes a stone staircase that drops 50 feet to the lake. The finely constructed stairway leads to an algae-covered pool that no longer lives up to its name. 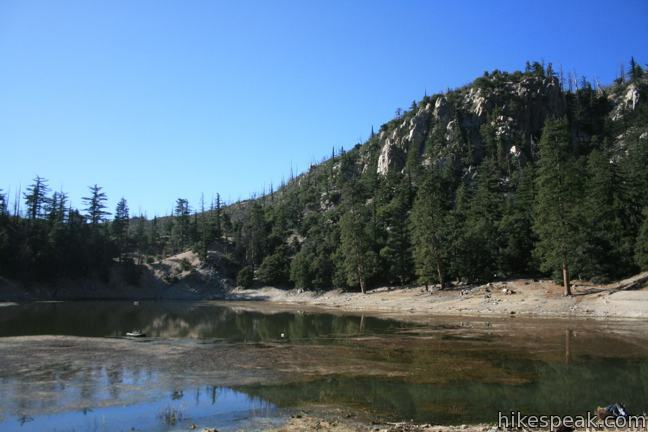 The approximately 3-acre lake is nestled in a pine forest with rocky summits above. It is easy to image Crystal Lake’s past and future glory. Unfortunately, the lake is in a lackluster state, thanks mostly to the long-burning wildfire that scorched 20,000 acres around the lake. 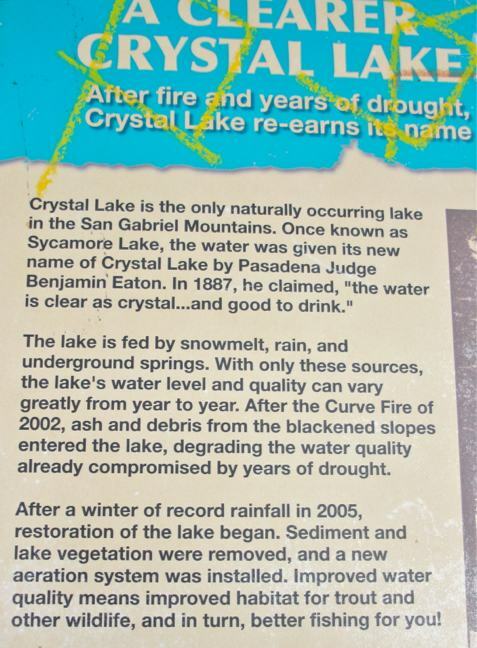 After the 2002 fire and subsequent road damage, Highway 39 reopened to Crystal Lake in the Spring of 2011. While the forest in this area has made a healthy comeback, the lake will still benefit from a few more years of recovery. Fisherman flock to Crystal Lake to catch rainbow trout. Swimming is not allowed. 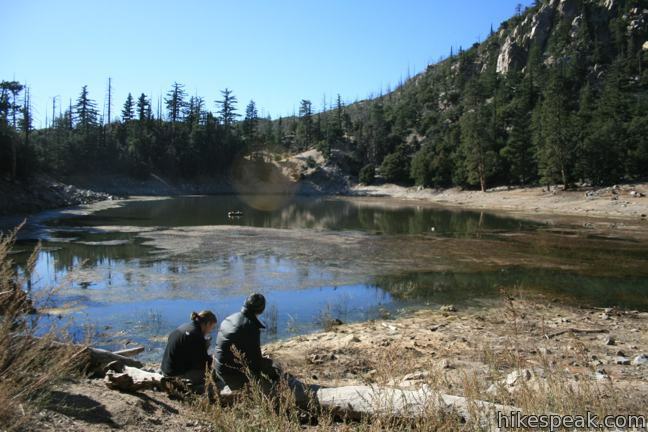 Crystal Lake will look its clearest after the spring runoff (and a few more years of recovery). 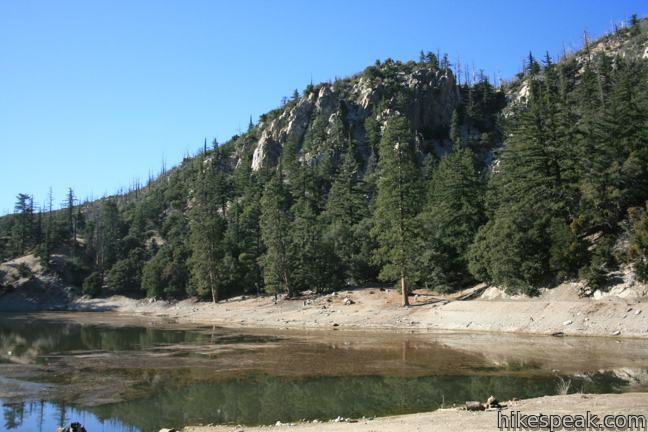 An adventure pass is required to park at the trailhead but no permit is required to visit Crystal Lake in the Angeles National Forest. 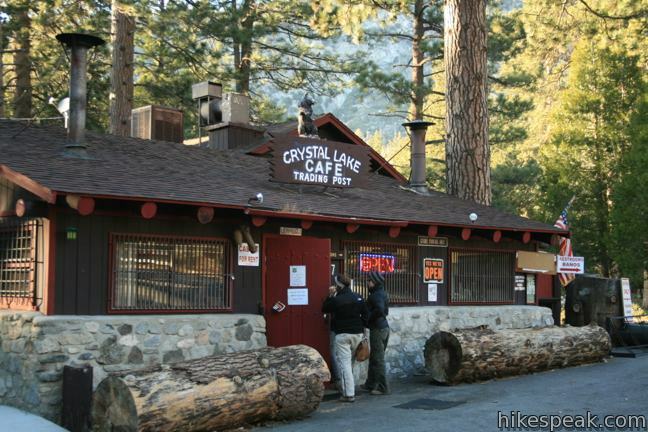 To camp or snack after your visit to Crystal Lake, drive a third of a mile up the road past the trailhead to the Crystal Lake Campground and Cafe. The sprawling 257-site campground is on the left, while the Crystal Lake Cafe and cabins are on the right. The “cafe” is set in a rustic log cabin. Inside, you can order burgers and hot dogs at the counter, or sip on a delicious hot chocolate (perfect for cold days at this high elevation retreat). 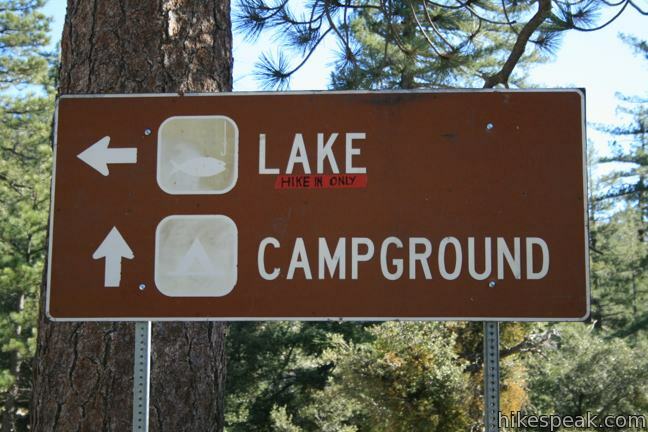 Sites at Crystal Lake Campground are $12 per night from May to October (price as of 2018). The campground is open to day-use only during the winter (Coldbrook Campground is seven miles away and open year-round). Picnic tables, fire rings, and flush toilets are provided, along with a great city escape in a rustic pine forest. Sites can be reserved by calling 877-444-6777 or by visiting recreation.gov (for group sites only). To get to the trailhead: From the 210 freeway in Azusa, take exit 40 and drive 24 miles north on Route 39. When the road splits, turn right on Crystal Lake Road and drive 1.2 miles to the trailhead/turn for Crystal Lake. Park on the right across from the paved road up to Crystal Lake. 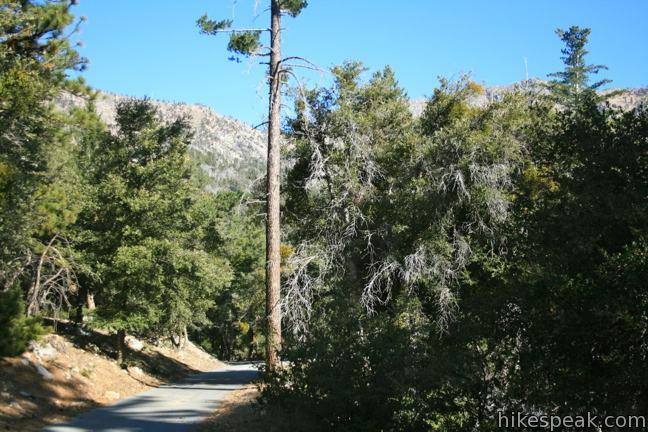 This 7-mile hike ascends 1,800 feet to a 5,111 foot summit with panoramic views over the San Gabriel Mountains. This adventurous 10-mile round trip hike reaches an abandoned and out-of-place bridge with a unique history. 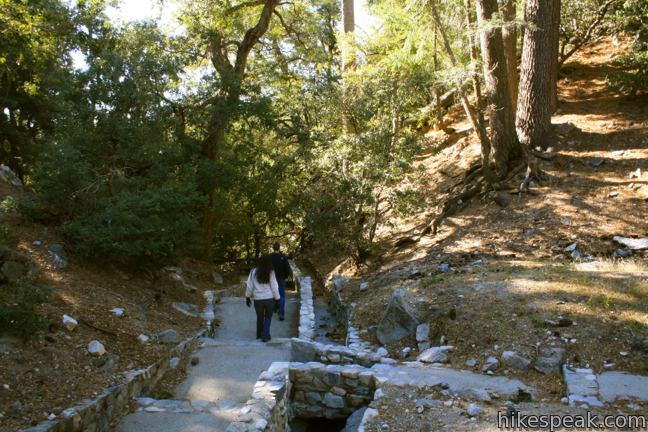 This hike of 3.6 to 6 miles (or more) starts from the same trailhead as the hike to the Bridge to Nowhere and climbs toward Iron Mountain and panoramic views. Camped at Coldbrook area 60 yrs. ago, I remember a buried town just north of coldbrook, an area with chimney’s sticking out of the sand and rock riverbed, is it still there ? First of all can you swim in the water????? Second of all if you can swim is there LEECHES???? first of all, if you read the article you will find your answer…. I was wanting to go to Crystal lake sometime this week. Is there snow there? I’m just wondering if I can get there without chains.